April 22, 2016 By Allyson 1 Comment This post may contain affiliate links. Read my disclosure policy. 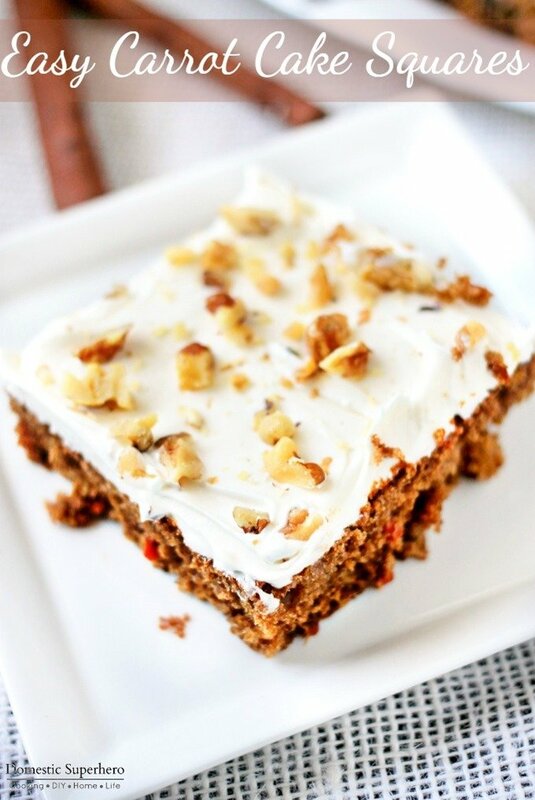 Easy Carrot Cake Squares are the full of fresh carrots and topped with delicious cream cheese frosting and walnuts! 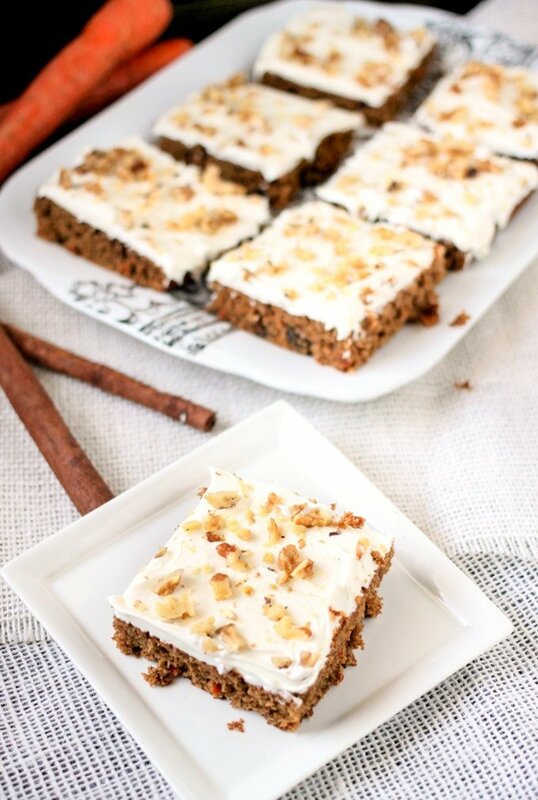 The last couple weeks I have had MAJOR cravings for Carrot Cake…but, you know, sometimes I feel like carrot cake is a seasonal food, and that time has passed. Well, I decided to make it anyway and boy, was I glad I did! 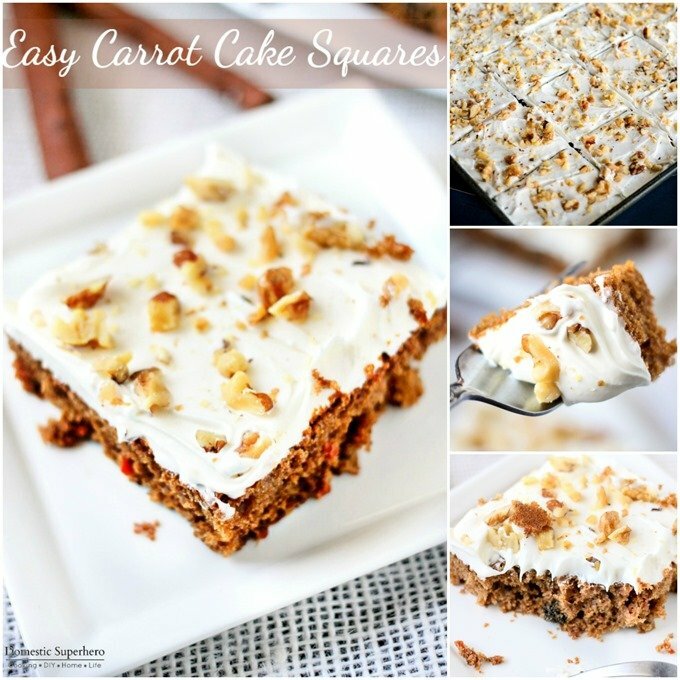 Using a baking sheet for this recipe, makes these Easy Carrot Cake Squares the perfect size, and you won’t feel guilty because they are rather petite. 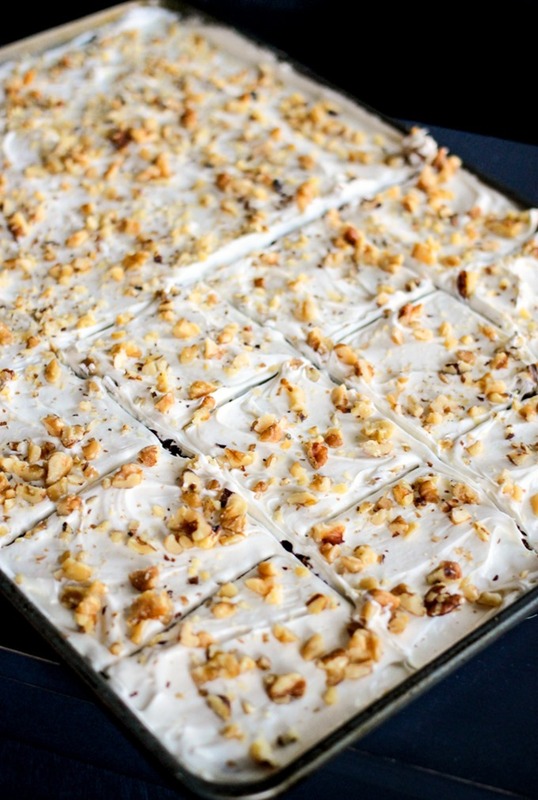 I also love that since you use a large baking sheet to make these, there’s enough to feed a crowd. These are perfect for a party, BBQ, sporting event…you name it, these are great. 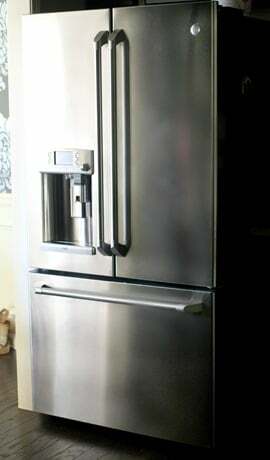 Oh, and remember I mentioned a few weeks ago that I got a new fridge? Well, now that I have so much space in the GE Café Series refrigerator with Keurig Brewing System, available at hhgregg, I can put the baking sheet into the fridge without having to worry it’s not going to fit! 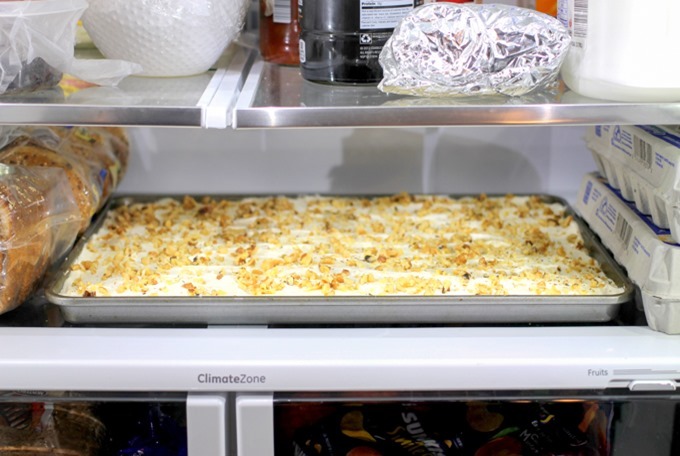 My old fridge could never hold such a large baking sheet! 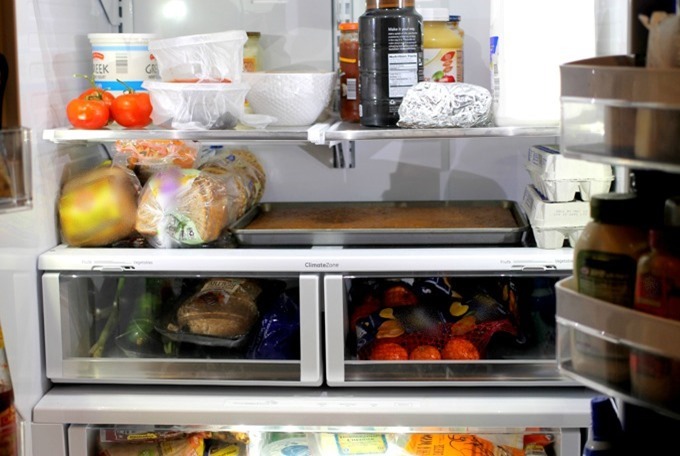 As you can see, it takes up just more the half the shelf in the fridge, while in my old side by side fridge/freezer, this would have never fit! Ahhh, I love it. These little things make life so much easier! After the cake is completely cooled (I usually let it sit overnight), then I make the frosting, frost the cake, and then put it back in the fridge to set. I cut the cake right before I serve it, which keeps the inside super moist and delicious. 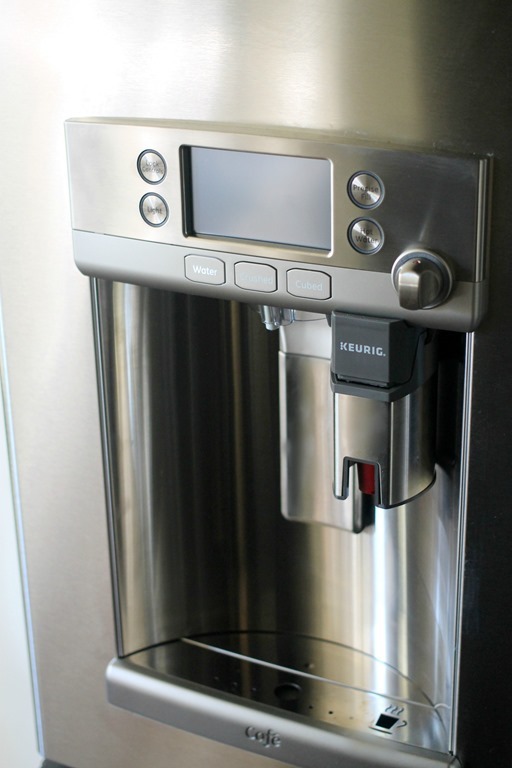 Speaking of making life easier, I just can’t get over the built in Keurig and hot water dispenser on this fridge – it makes getting my morning coffee and oatmeal so simple. The fridge has Wi-Fi, so I can warm the water from my cell phone right when I wake up, and then by the time I am downstairs it’s ready to go. Since you can use hundreds of varieties of K-Cup’s with this brewer, it’s really simple to find something I love, and I’ve had a lot of fun trying new coffee flavors I never thought of trying in the past. After my coffee is ready, I just dispense some hot water into my oatmeal bowl, let it sit for a minute, and then I am ready to eat and get out the door! Did I mention it’s pretty? Like, so pretty!? 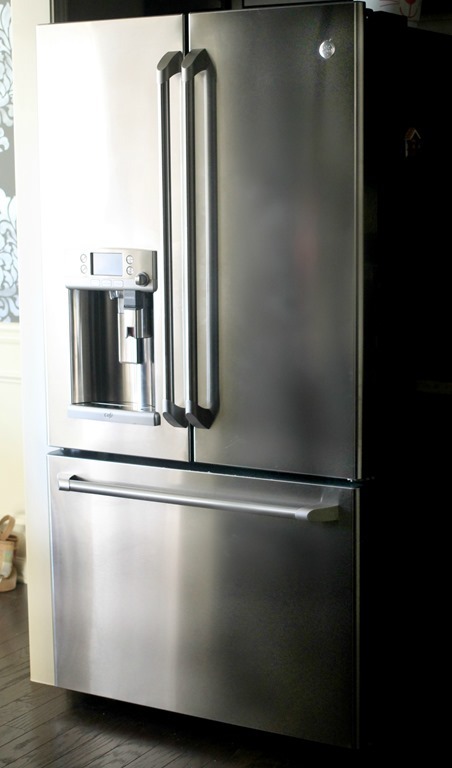 I love looking at it, and everyone who comes over gives the fridge endless compliments. We are moving soon and I felt bad when people would look at the house and admire the fridge…then find out that we are taking it with us! Can’t leave this beauty behind! In the bowl of a stand mixer, combine flour, baking powder, baking soda, cinnamon; set aside. In a medium bowl combine the eggs, shredded carrots, brown sugar, sugar, oil and vanilla; mix until combined. Add carrot mixture to flour mixture, mix on low until just combined. Fold in 1/2 cup of the chopped walnuts. Do not over mix. Pour batter into a greased 12x17 baking sheet; spread evenly. Bake for 20 minutes or until a toothpick inserted in the center comes out clean. Cool completely and top with frosting (see directions below). Using a mixer, cream together butter and cream cheese. Add the salt, vanilla and one cup of powdered sugar and mix until combined. Add remaining powdered sugar and mix until smooth and creamy. If frosting is too thick for your liking, add some milk (around 1/2 - 1 TBS). Spread frosting over cooled cake. 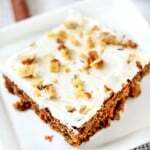 Top cake with remaining chopped walnuts, cut cake into squares. This is a sponsored conversation written by me on behalf of hhgregg. The opinions and text are all mine.